Our success has been based on having the right metal sawing machine available from stock for your application and having the experience to solve your cutting problems. 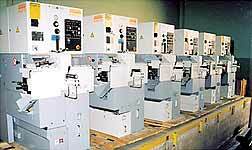 We keep an average of 60 metal sawing machines in stock for immediate delivery. 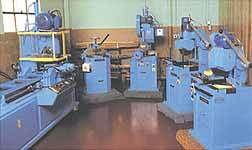 Showroom for our program of Versa-kut sawing machines for straight and mitre cuts. Our sawing machines are always under power and we welcome the opportunity of demonstrating them for you. Send us your material for test cutting and we will work out a detailed time study for you.